The Up, Down, and Out Delivery - Everything Wrong with It! This is a BR Premium Article! We made this BR Premium article available for everyone to read so you could see the type of content that would be available to you! Like what you see? Sign up now! Whenever I have a new evaluation come into Baseball Rebellion HQ or sign up for an online lesson I get excited. Especially a young player who is in the beginning stages of throwing a baseball. I also value the opportunity to meet the parents to learn the most about their son or daughter. Parents seek instruction for their child to grow as a player and entrust me to help them through our throwing process. I owe it to both player and parent, to educate and inform them all facets of throwing a baseball, specifically pitching. There are many important questions I ask allowing me to determine if an individual has started to become a victim of the Up, Down and Out Delivery. The delivery I am describing consist of a few points of interest that an instructor tells the pitcher to get into. First is the balance point, where the leg lifts Up into a balance point, which is not a bad place to start. A kid should be able to balance on one leg. If not, they should not be pitching in the first place. The second is putting the front leg directly down to touch the ground in front of you with the ball of your foot. You will see many instructors teach this movement to start a pitchers delivery. There is nowhere else to go now but Out toward your target. So the ques that are given in this delivery are as simple as they come. “Get to your balance point, step and throw.” Unfortunately, that is not how easy it is but is still taught all over the country every day. Here are some of the key points to identify the fundamental flaws of this problematic delivery. By forcing each individual into standard positions, all natural athleticism gets lost. The emphasis on the balance point forces the body to stop it's momentum and ruins a constant flow of movement between the body and arm. The "Power T" forces our arm into a standard position and leads to a decrease in arm speed. Showing the ball to 2b, the elbow and shoulder joints undergo elevated stress (Tommy John Twist). The lead foot gets ahead of the body too quickly, losing a large percentage of our mass into each throw. Facing the lead foot sideways puts more stress on the front knee as rotation happens. The foot has to open up anyway to throw the baseball to the intended target. All these components of the delivery lead to the arm not being supported at "foot strike". The chest is level/ forward and the hand and elbow are above the shoulder, causing the arm to take more of the stress into acceleration. This is an evaluation video of 12-year-old Connor K. He clearly starts his leg lift going Up, then Down to the ground and Out with his front foot toward to target. This is not his or his dad's fault he looked like this at his evaluation. They may have watched a youtube video that was posted for pitching mechanics for youth pitchers. This video below has been viewed 1,184,884 times and counting. This is exactly why we are named Baseball Rebellion in the first place. We are not rebelling against baseball in general but the things still taught online and in person to youth pitchers and hitters the last 30 years. 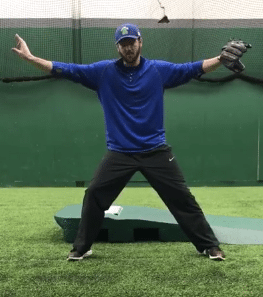 You can fast forward through this YouTube video and identify all the positions I just mentioned above in the fundamental flaws of the UP, Down, and Out delivery. I see the Up, Down, and Out delivery as a simple way to teach pitching mechanics to a large group of pitchers, especially young kids learning to pitch for the first time. Camps and clinics of most major D-1 universities will use a variation of this concept to teach tons of kids, all the same information, in one setting. All kids are unique, so let them be different! 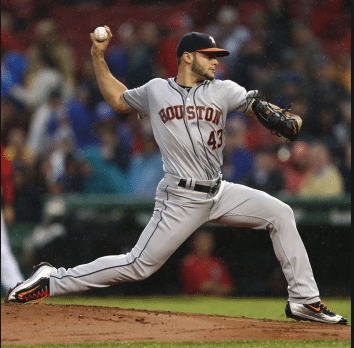 The uniqueness of every athlete is a big reason why I believe that when you are teaching specialized movements, like pitching or hitting, large group settings are not beneficial to the athlete. Small groups, or even individual training like we do at Baseball Rebellion, allows for each athlete to be treated differently and have their movements adjusted accordingly. This leads to the questions: How do we sift through the mounds of information and choose an option that’s beneficial for development? What’s the right path? Tons of instructors legitimize their information by regurgitating what they did as a player. I was a culprit of this teaching method before working at Baseball Rebellion. Playing at a high level and taking the information learned throughout your career is a great starting point, but not when it comes to analyzing kids and trying to revamp a pitching delivery. More than often a college or professional pitcher was also an exceptional athlete during their playing, and this athleticism does not transfer to the youth thrower they are working with in the present time. This leads to frustration from the instructor because they “know” what they are teaching works and frustration from the thrower because they are not physically capable (yet) of performing these movements. Can your instructor effectively communicate your information to players at any level: an 8-year-old, a middle schooler, a Division 1 recruit, a Professional player? Can your instructor design a program that effectively allows the youth player to develop properly and be able to switch gears when the player gets to a 60/90 field, the high school level, college level, and professional level? Is your instructor preparing your kid for the next step or simply just trying to “get them by” where they are currently at in their career. I thought I knew a fair amount about pitching before I came to Baseball Rebellion but I was wrong. When I started researching and learning about the movements I now take into my movement patterns, I realize now what was true and what was false. A clean "Arm-Swing" is vital to the health and longevity of any thrower, at any level. The arm swing is the path the arm takes as the hand breaks away from the glove. Through hours of video study, and looking the various patterns of pitchers arm action, I have determined the most efficient arm swing exists in a path where the hand falls out of the glove staying relaxed into the swing. The elbow of the throwing arm should be in a close relationship with the elbow of the opposite arm (glove side). As the throwing arm continues into its swing, the thumb should stay underneath the baseball with the fingers facing between 3B and SS. Right before the front foot makes contact with the ground, the throwing elbow should be slightly below the shoulder. A better “Lower Half” start is essential in creating effortless energy through the pitching delivery. Increased momentum from the back hip gradually moving forward and rhythm from being more natural and athletic are key. Try getting the rhythm and timing part done first and less on the momentum. Once you find your signature timing pattern, you can increase how quickly your back hip moves forward. And always practice repeating your mechanic’s whether using a mirror or not. Far too often I find too much emphasis placed on increasing velocity and not enough on being consistent in the pattern. If you become an expert on the efficiency of your mechanics, you can have both accuracy and velocity. Always asks questions. Make sure you understand the “WHY” behind the information. If your coach/instructor is having your son do a drill, make him accountable for the information. Ask him to show proof of how his information holds up. You don’t want to hear stories about how good he was or claimed to be. Realize you have the right as a parent or player to know where you’re investing your time and money. Seek out the best. Sign Up For BR Premium to Get More Content Like This!